So, this was not the dinner that I had planned on making last night. When I was gathering up all the ingredients that I needed for my original plan, I noticed that I didn't have everything. I know, you're probably saying, "Why didn't you just go to the grocery store and get what you needed?" Well, can't really leave the house when you're toddler is napping and I try not to wake him from his naps. So, the only thing thawed was 2 chicken breasts. It was either going to be chicken enchiladas or chicken nuggets. I went with the nuggets because they were going to take a little longer and I didn't want the food to be cold when Jon came home from work. I'm just going to be honest, I love chicken, but I hate cutting it. Actually, I hate to cook, but I do it because in the long run it saves you money to cook at home and it's actually healthier for you. 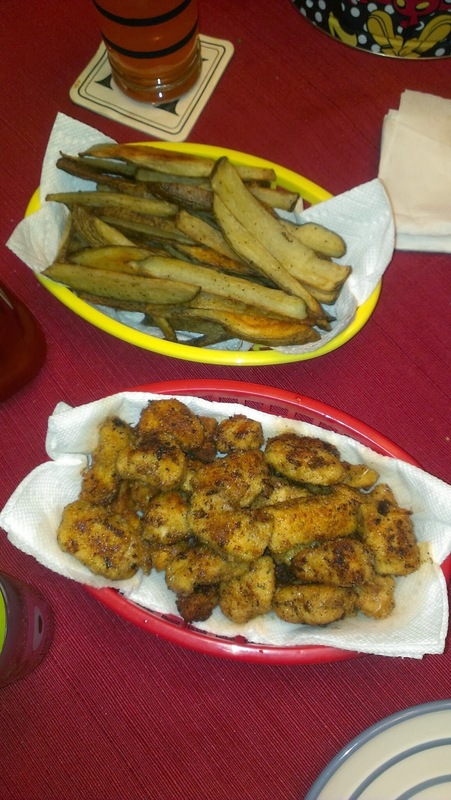 The recipes are, of course, from my friend Mandee (Stay at Home Chic-fil-a Night! and Hand-cut Oven Fries). I think if it wasn't for her creating her blog (~The Kitchen Wife~) and sharing her recipes and cooking tips, I would still be getting sick of eating the same stuff over and over again. I did finally get to use my handy-dandy breading plates I purchased 6 years ago from Pampered Chef to do the breading of the nuggets. I had originally bought it for Jon and his love of breaded wings, but was finally used the correct way last night. The fries were good, but there must be something wrong with my oven. It took my oven an hour for the fries to be nice and crispy. I had to have the fries nice and crispy because Jon has a problem with fries that are not cooked completely. Other than the fact that they took longer to bake, they were yummy with some ketchup. The nuggets were the main hit of the meal for Jon. He said that he would rather have these nuggets than go to Chick-fil-a. So, yay for finding something new to add to the things that Jon will eat! 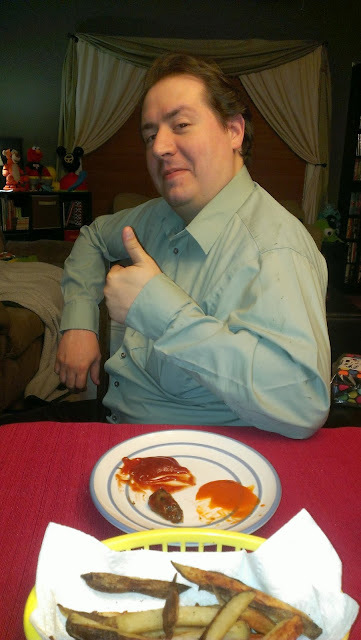 It has to be good if Jon gives his seal of approval! Try it out for yourself and let Mandee and I know what you think.